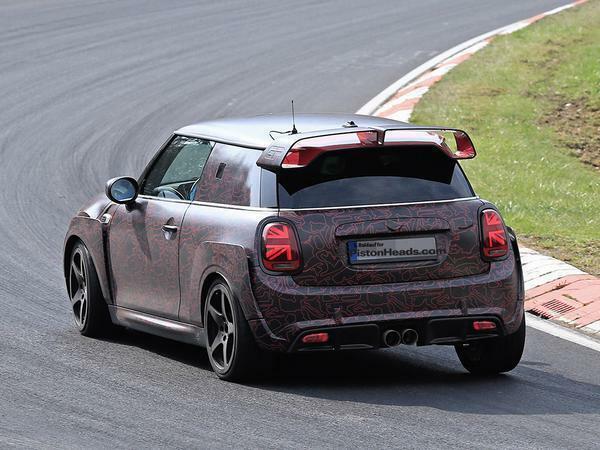 Mini is developing its most potent and aerodynamically-influenced hot hatch yet – and, if the development car’s anything to go by, it’ll sport one of the largest fixed rear wings ever fitted to a production supermini. 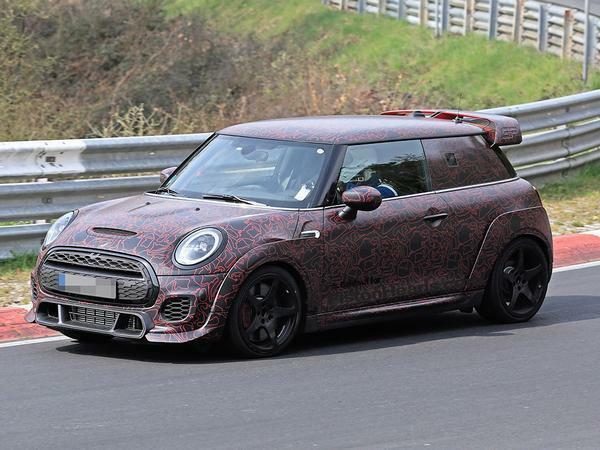 The 2020 JCW GP, seen here testing in Germany ahead of its reveal in late 2019, is on course to retain much of the addenda fitted to the concept that previewed it, suggesting Mini’s two-seat performance halo will produce lots of downforce to provide a more compact alternative to Renault Sport’s Megane Trophy-R.
To do that, it’ll also need plenty of extra power, so a boost of over 70hp on the current JCW variant is due for the back-seat-free GP. This would edge the peak output of its turbocharged 2.0-litre four beyond the 300hp mark, ranking it directly alongside the larger Trophy-R and giving the GP potential to shake up a real storm in the hot hatch segment. Could it topple the Civic Type R from its pedestal and set a new benchmark at the Nurburgring? There’s a good chance those two targets sit somewhere near the top of a white board within BMW’s Nordshleife base, where it's been testing the latest development car. The first – and much adored – Mini GP from 2006 shed 50kg from the JCW’s kerbweight thanks to its lightweight wheels and stripped rear, and the successor lost 55kg with its similar diet. If the same were true for today’s JCW, the GP should tip the scales at about 1,250kg – giving our anticipated 300hp car a power-to-weight ratio of 231hp per tonne. Which, by pure coincidence, is conveniently identical to that provided by the Type R.
Sounds interesting. But veering in to Type R territory on looks. Daft looking spoiler looks daft. This will get some frothing at the mouth, another 2 seater hatch! I love that camo, it's made up of world racing circuits. It has a roof, two seats and a heater....what more is needed? This site is getting bad if i feel i need to point out lazy journalism . 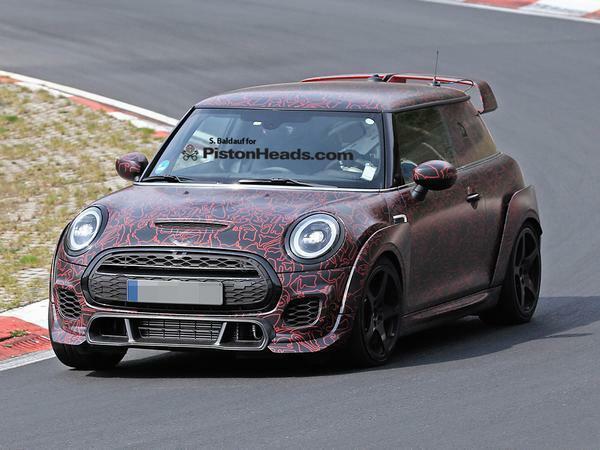 I had a jcw challenge edition when they first came out and was looking forward to the gp3 as a potential purchase ....... however if it looks anything like this I’ll be steering clear no matter how good it may be to drive - those arches are hideous and that rear wing !! the first two were great, I prefer them than the renaults tbh so much fun! I have a deposit done for one. However, I’m not convinced by the looks. But if it’s 300bhp I don’t know if I could say no. Having owned a cooper, cooper S, and now a JCW, I'm probably the target market for this. However, those arches... I've always claimed I drive a MINI for how it drives, not how it looks (I've had a Clubman and a Coupe FFS!) .... but I think I've found my limit. Those Pistonheads watermarks are crap. 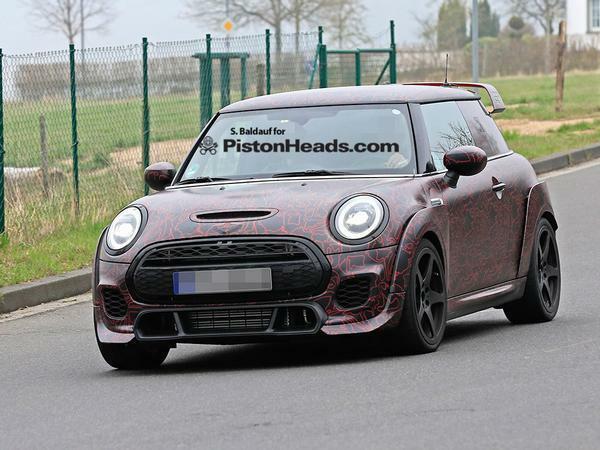 Are BMW Mini having flashbacks to the late '90's / early '00's modding scene with that rear spoiler Not far off the Evo / Scooby look spoilers that got grafted onto the rear end of R5GTT's, Civic's, etc. Bar the spoiler and the, hopefully prototype, arches it looks interesting though. These things on the mini look like stick on cardboard efforts, surely they must be concealing the real flared arches underneath??? ?